Establishing the right look to attract the right clientele to your business is the most important thing when launching a new business. Its even more important in the restaurant industry where perception is king. La Porta Laterale is a restaurant concept designed by Barry Edwards of Edwards Communications that attracts higher end patrons and makes them feel like they’re getting the best of the best. 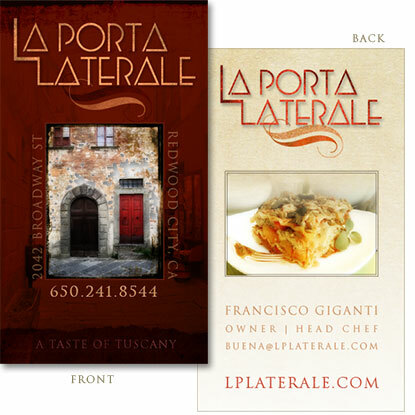 Each facet of their image, from logo to business card to menu, communicates the rustic Tuscan flavors of its heritage. You can view the menu here.